VerticalResponse is a well-known and -respected provider of email marketing services. Their software is supported by an impressive list of free webinars which you can watch to educate yourself on the email marketing software features that they provide. VerticalResponse was founded in 2001 and is headquartered in San Francisco, CA. The US-based company is ranked as one of the 343 Fastest Growing Companies in North America on Deloitte’s 2011 Technology Fast 500. It’s also been on the San Francisco Business Times list of local fastest-growing companies for seven years running. The company has more than 100,000 customers around the world and has received a number of awards. They are well known for their customer support features and for creating a program which is well developed in all aspects, and with few shortcomings. Includes a very impressive list of free webinars to educate yourself. Impressive real-time reporting features. Archiving of newsletters provided free of charge. Their autoresponder service doesn’t include a sequential option. The Perfect Plan – FREE! Want to try this email marketing service? You can try them for free, without a credit card and get access to up to 1,000 email contacts, send up to 4,000 emails per month, limited time autoresponders, connect one social media account, unlimited signup forms and more. This plan allows you to see how the service will work for you and there’s always the chance to upgrade if you need to access the pro features like more social accounts, more email send and marketing packages. VerticalResponse offers a number of marketing products, not just email marketing software. Their site isn’t the easiest to navigate, though they do provide a lot of services. Their newsletter features include more than 700 free templates and step-by-step email creation. Automatic sharing on Facebook and Twitter is included in your features so that you don’t need to waste time cross-posting to your social networking pages. You can also share coupons for your online store through email, which is a great way to motivate shopping. The company guarantees 98 percent email delivery success. Archiving of newsletters is provided free of charge. Bulk email subscriber management tools are listed on a separate part of the website. Opt-in forms are included that you can embed on your website, blog, or Facebook page. The form builder helps you to optimize your form so that you can collect useful information about your subscribers. You can then segment your mailing list accordingly. There are no opt-in templates, which is a bit of a drawback since you can’t customize the appearance of your sign-up area. You are able to segment based on demographic information or interests as collected on your opt-in form when subscribers join your list. You can then mail out offers and promotional emails based on those interests or demographics with a single click. With targeted email marketing, you can ensure that the subscribers who are most interested in specific offers will be the ones to receive them. You can resend messages to customers who did not open or click in case they missed the initial email. Split testing capabilities are included in the bulk email software so that you can optimize your email marketing campaigns. Test two versions of a message by sending them to two similar groups and see which message performs the best. Then you can update your entire campaign according to what your split test has revealed. This tool gives you a concrete technique which you can use to enhance your campaigns. Click-to-conversion email tracking allows you to put code on your website to track your visitors and see which ones came from your email marketing campaign and which messages they followed to your site. 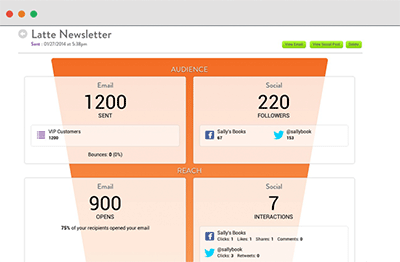 The analytic information also tells you which messages provided the most revenue. You can also integrate with Google Analytics for additional information. All in all this is an impressive selection of real-time reporting features. We’ve seen slightly more comprehensive analytics included in several other email marketing programs, but overall there is nothing to complain about. There is no FAQ page, but there are more than 50 video tutorials on the website for the company’s many products including the bulk email marketing software. There are also text-based tutorials which fill the role of a knowledgebase. Live and recorded demos and webinars are available for you to peruse at your own pace. This collection of demos and webinars is one of the most impressive features of the company. You can get in touch with a customer service agent via telephone, email or live chat. The help desk is staffed seven days a week. Since many email marketing software companies only staff their help desks during weekdays, this is a nice advantage. Pricing for the email marketing services which VerticalResponse provides is very reasonable, and there is a free account option for new customers who want to check out the features before committing to a plan. If you’re willing to pay in advance, you can receive a discount for prepaying. Ten percent off is given to clients who pay for six months in advance. If you can pay for a whole year in advance you can receive 15 percent off your bill. The lowest tier allows you to subscribe up to 500 recipients for $8.80, which is one of the lowest prices we’ve seen for email marketing services. The next tier up, 1,000 subscribers for $17.60, is comparable with many other services we’ve reviewed. 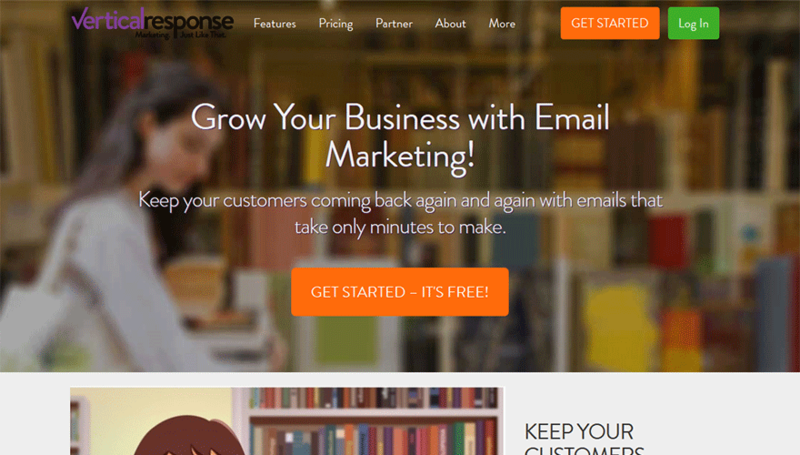 VerticalResponse’s email marketing program thus seems to be aimed largely at small to mid-sized businesses. If you have a larger company you might find better prices elsewhere, though VerticalResponse still is a reasonable option. The lack of autoresponder features is a drawback, but it’s also far from a deal breaker; aside from this little gap, the email marketing features included in VerticalResponse make it a well-rounded email service which is worthy of your review.